Working on Multiple Computers ? In case yes you do work on multiple computers at one time, then read on this post and know how easily you can control multiple windows computers (at max 4 computers) using a software KVM Switch. Traditionally a KVM Switch (Keyboard, Video & Mouse Switch) is a hardware device with which you can control multiple computers using a single set of Keyboard & Mouse. Yes a traditional KVM Switch provides a quick way to control multiple computers running different operating systems. However if you want to control multiple windows computers, then a software KVM switch can be a good alternative. Microsoft provides a free software KVM switch to control max upto 4 different windows computers. The Windows Computers might be running different operating systems or even different bit length (i.e. mixture of 32 bit and 64 bit windows computers). This Free KVM Software can be downloaded from Microsoft Website by searching for the software name using any search engine. 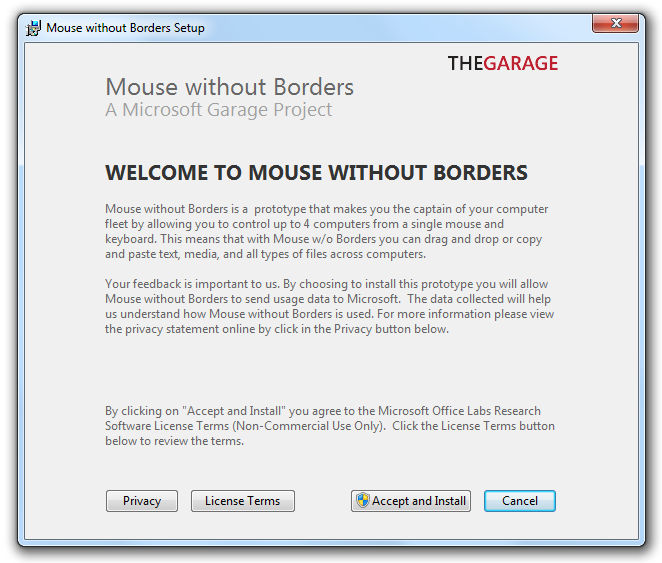 This software allows to share keyboard and mouse across other connected computers. Given below points describe how to use this free software and control multiple windows computers using this free kvm software. Google with the Software Name, Download & install the Software on all the computers you wish to control using single set of Keyboard & Mouse. The Free KVM Software adds a System Tray Icon which can be used to control various features of the Software. Once installed you would need to identify and validate the computer to be connected using this virtual KVM Switch, just follow the screen prompts and you should be able to connect all your desired computers in no time. One thing to note here is that this software is not a screen sharing software. This Free KVM Software will not show you other connected computer’s screens & you yourself should be able to see the connected computer’s screen visually. This Software can be useful when you do have multiple computers running on your desk and you can visually see them. Once installed, you can move the mouse cursor to other computer as you would move your mouse cursor on a multiple monitor windows computer in extended mode. Just move the mouse cursor towards the next monitor and your mouse cursor will move onto the next computer. With focus to an active application window, you can use the keyboard connected to some other computer and type like normally you would do. You can do copy and paste for text across computers, files across computers and you can even use drag and drop across multiple computers using this free kvm software. You can Lock all the computers easily using Windows Key + L key combination when connected in All Mode of this Free KVM Software. You will be able to change the Login Screen using this Free KVM Software as well. In case you would like to have another free software just for the purpose of changing the login screen, you can download Logon Controller for 32 bit Windows Computer and in case you would like to change the Login Screen on a 64 bit or 32 bit Windows computer, you can download MurGeeMon Software which is basically a dual monitor software and has extra feature to change login screen, screensaver, etc.